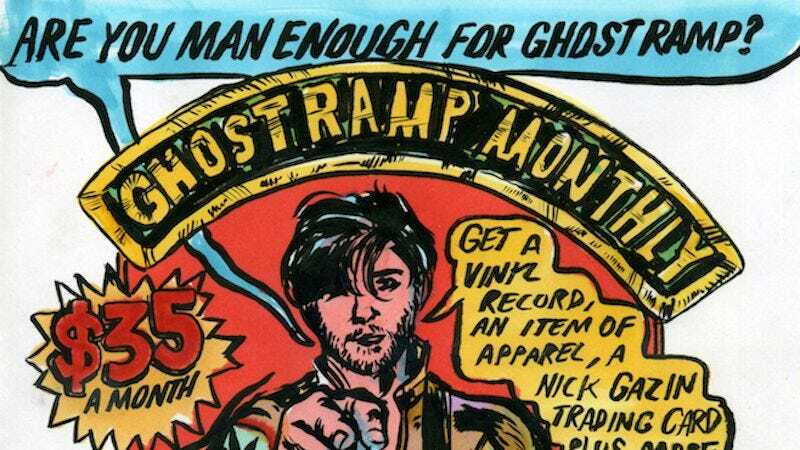 Fans of indie music and never leaving the house are now in luck: Ghost Ramp—the record label founded by V rockers Wavves—has announced the start of a new subscription service that’ll bring music, clothing, and collectible swag to the fashion conscious shut-in. Kicking off in January, Ghost Ramp Monthly is offering a $35 subscription box, including new vinyl from Wavves and their usual collaborators, alongside monthly apparel selections and a trading card drawn by Vice New York art director Nick Gazin, the guy behind the cover art for Run The Jewels 2. The first record from the service will be a 7” collaboration between Wavves and their No Life For Me partners Cloud Nothings, featuring the songs“I Find” and a demo for the title track from their 2015 joint LP. February subscribers will get a similar release, while March will see Wavves frontman Nathan Williams treating fans to a 12” from one of his side projects, Sweet Valley. Williams and his team also released a statement to promote the release, calling it, “The perfect way to give some of our best, most unique work exclusively to our biggest supporters.” The subscription-inclined can check out Ghost Ramp Monthly here.